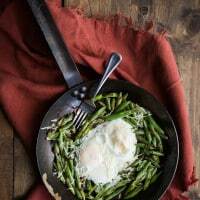 Egg and Green Bean Skillet | Naturally. 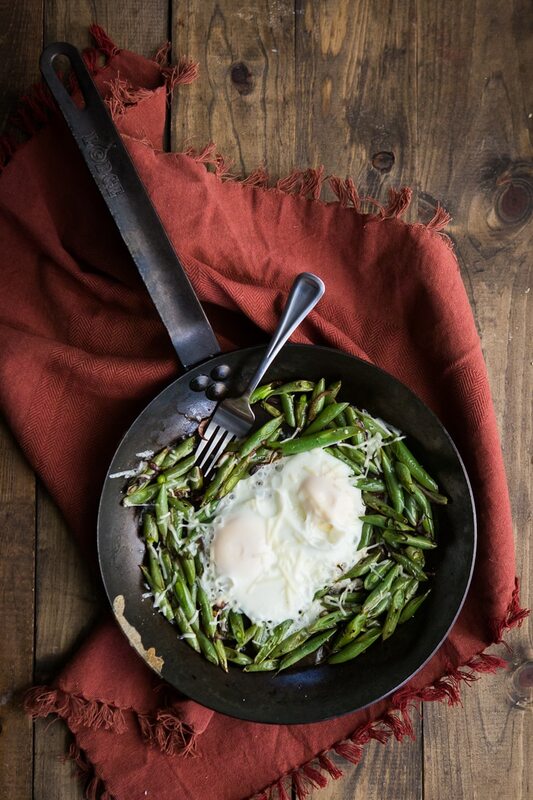 For a good chunk of my life, I don’t think I knew green beans could be eaten outside of a can because about the only time of year they came into our house was around the holidays, destined for one specific dish. Even after I moved past the can and into eating fresh green beans, they were, for the most part, relegated to a side dish or on occasion salad- always for dinner. It wasn’t because I didn’t like them. In fact, I love the flavor of fresh green beans. It’s just I always found them a bit awkward to work with, even after chopping them down into smaller pieces. Prepare green beans by removing the ends and then cut the green beans on the bias in 1/3″ slices. Heat olive oil in 8″ over medium heat. Add slice onions and cook for 3 to 4 minutes. Stir in green beans and continue to cook, stirring occasionally, until green beans are tender and blistering, 6 to 8 minutes. Sprinkle in salt and pepper then create a well in the middle. Crack eggs into the well, cover, turn heat down, and let cook until egg whites are set and egg yolks are set to the desired consistency, anywhere from 8 to 12 minutes. Serve with a sprinkle of asiago cheese. Simple and perfect. This is exactly the kind of dinner I want to eat when I’m super busy. Oh, I love green beans! And this is too funny, yesterday’s breakfast was a rice bowl made up entirely of rice, green beans, and a runny egg. Great minds! SO perfect. What a delicious breakfast/lunch/dinner/brunch/basically any meal! Mmmm, egg skillets are the bomb diggity! Super delish! I love the perfect simplicity of this! I am so making this as soon as I get some green beans! This looks wonderful. So simple but so good. I still like canned green beans! Eating this right now as I type. I had to sub garlic for onions because I am out, and added a little cilantro. Soooo good! Green beans for breakfast, baby! this is everything rn! In a world where I want a filling breakfast but also want to be a little healthy & start my day with some veggies…this is absolutely perfect. Never knew green beans could taste SO GOOD!